Part of some estimated 300 students at Columbia University gather around Hamilton Hall on the campus in New York. Fifty years ago students occupied five buildings at the university and shut down the Ivy League campus in a protest over the school's ties to a military think tank and what protesters saw as racism toward Columbia's Harlem neighbors. More than 700 protesters were arrested and more than 130 were injured when police retook the occupied buildings, during what was part of a year of global turmoil. 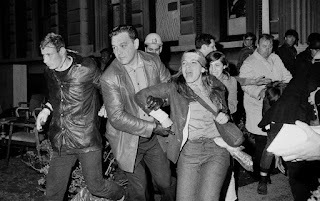 NEW YORK (AP) — Fifty years ago Monday, Columbia University students angry about racism and the Vietnam War began a rebellion that fed a sense the country was in turmoil. 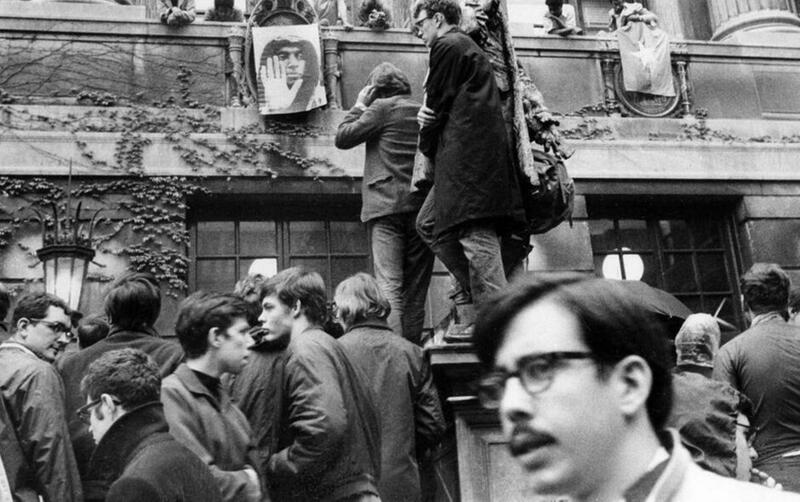 Starting at noon on April 23, 1968, student militants occupied Hamilton Hall, the main classroom building, and took a dean hostage for 24 hours. They stormed into the office of the university's president, ransacked files and smoked his cigars. Over the next few days, hundreds of students would seize a total of five campus buildings. The occupation attracted global attention. Black militant leaders Stokely Carmichael and H. Rap Brown visited the protesters. China's Chairman Mao Zedong sent a telegram. Then, early on April 30, a thousand police officers swept in and cleared out the rebels. "In the club swinging, fist fighting, pushing and kneeing that marked the violent subjugation," The Associated Press reported at the time. One hundred students and 15 police officers were injured. Police made 700 arrests. The protests were part of a year of global tumult that included Vietnam's Tet Offensive, the assassinations of Martin Luther King Jr. and Robert F. Kennedy and mass demonstrations at the Democratic National Convention in Chicago. As Columbia prepares to observe the anniversary, some people who lived through the occupations see parallels with today's young activists, such as survivors of the high school shooting in Parkland, Florida. "When Parkland happened and I saw particularly the young women speaking angrily and passionately about what had happened and what had to change, I just heard my own voice," said Nancy Biberman, who was a student at Barnard, the women's college affiliated with Columbia. Recollections of others who were there: A RACIAL DIVIDE Two grievances sparked the protests: Columbia's ties to the Institute for Defense Analyses, a weapons research outfit, and a university plan to build a gym in a city park that would have separate doors for Columbia students and for the surrounding African-American community. Black and white students began protesting together. But soon, black leaders at Hamilton Hall asked their white counterparts to leave and occupy their own building. Raymond Brown, a leader of the Students' Afro-American Society, said the black students had grown weary of their white counterparts' revolutionary rhetoric. "We were aware from day one that this was a demonstration and not a revolution," said Brown, now a lawyer. Carolyn Eisenberg, then a graduate student in history, was among the white protesters asked to leave. "I think people were kind of shocked and disoriented," Eisenberg said. "The moment when black students said 'We want you guys to leave' didn't feel that great. But the animus toward Columbia University was so dominant that that kind of took over." Karla Spurlock-Evans, then a freshman at Barnard, went to Hamilton Hall to hear a band called the Soul Syndicate and stayed for the occupation. "Being in that building, sensing the power of what can come when people who have a common goal that is righteous come together with goodwill and good intentions and love showed me that real change can be accomplished," said Spurlock-Evans, now dean of multicultural affairs at Trinity College in Hartford, Connecticut. But support for the occupiers wasn't universal. Vaud Massarsky was a leader of a student group opposed to the protests called the Majority Coalition. "The press has ignored the great apathetic mass that was there to get a degree," said Massarsky, now a management consultant and author of detective stories. The Majority Coalition tried to lay siege to Low Library by forming a cordon around it, preventing food deliveries. But even Massarsky was shocked by the violence of the police response. "On all sides, we were horrified," he said. Hilton Obenzinger, who was among the students occupying the library, remembers standing on the ledge that surrounds the building and catching food that supporters threw. "We all kind of bonded together into what we called the Low Library Commune," said Obenzinger, now a writer and lecturer at Stanford University. Obenzinger said the occupiers tried to keep the building clean as they prepared to meet police. The black students in Hamilton were arrested peacefully and loaded into vans. But at the other buildings, police wielded batons and flashlights. "I have a very vivid memory of one cop sauntering up to one of the women and battering her head," Obenzinger said. "He just kept slamming into her. Everybody got beat up, some much worse than others." The school reopened in May. "The consequences for most people were nil. A few people were suspended, not many," said Michael Rosenthal, a former English Department instructor. Carol Berkin, a doctoral student, was horrified when her oral exams were postponed but then joined the protests. When her exams finally took place, her academic adviser Richard Morris, a fierce opponent of the protests, was there to grill her. So was historian James Shenton, a protest supporter with his arm in a cast thanks to the police. The two professors glared at each other. "I don't think they even noticed what I had to say," said Berkin, now a college professor. Grayson Kirk, then Columbia's president, died in 1997. A handful of the Columbia radicals later joined the militant Weathermen faction. One died in an explosion at a bomb-making den. Mark Rudd, the most visible leader of the 1968 protests, went underground. Rudd, now living in New Mexico, declined to be interviewed. student protester at Columbia University is forcibly removed from the campus by plainclothes New York City police after they entered buildings occupied by the students, and ejected those participating in the sit-ins. Fifty years ago, more than 700 protesters were arrested and more than 130 were injured when police retook the occupied buildings, during what was part of a year of global turmoil.